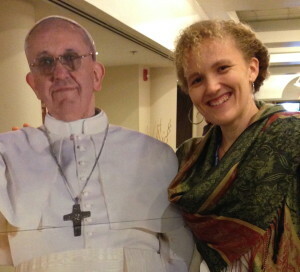 Yes Pope Francis and I got cozy at the Catholic Press Associations gathering. He was really nice, though a bit flat and didn’t talk much. Yesterday journalism and the role that it plays in my ministry to the world became clear. I attended the regional gathering of the Catholic Press Association of about 50 Catholic Press professionals. Two of the sessions I attended were led by people of faith working in the secular press and the third was a mix of Catholic and secular. Throughout the day’s sessions, the concept of being a witness, an educator, a minister found its way into comments, questions, and prepared statements. In his opening remarks, Father Snyder, president of Catholic Charities USA, evaluated the history of catholic social involvement in the United States. During his opening remarks, he mentioned the ministry of journalism as an integral part in serving the community and the poor. He spoke of how the Catholic Press has been key in bringing the personal stories into the immigration reform debate. Mike Walter, anchor at CCTV and producer, writer, and narrator of the documentary Breaking News, Breaking Down. A documentary exploring the trauma that journalists experience from repeated exposure to traumatic events. He is challenging the old boys model of drinking your troubles away after a traumatic experience. He spoke of ministering to the people in the news room, of taking time to minister to your own soul. He remembered trying to interview the family of a girl brutally murdered,”I wanted to tell the story of her life not her death. On these days, more important than a note pad and pen, is your open heart and ears.” Walter said, for him this is a very real part of healing for the families and the community. A witness was a vocational description I had heard before, though at the time I wasn’t sure what that meant for a career. It was in the subsequent year with my work researching conflict and my time in Uganda observing and learning, that I discovered that, for me, to be a witness is to be a journalist. To translate for the world the stories that seem foreign, to strip away the vagueness, the ambiguity, and misdirection to reveal a story of humanity attempting to make a better life, everyday. 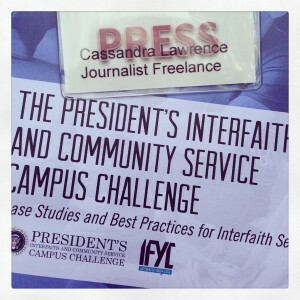 When I listened to the speakers yesterday, whether they worked in the Catholic Press or in the secular press, I knew I had truly found my vocational community. People concerned with humanity, with bringing the story to the world, so that we can be better informed, and better prepared to address the worlds greatest needs. This is my ministry. We so often confuse THE ministry with our ministry. As a United Methodist I believe that we are ALL called to be ministers to minister to the world. If we think the only way to do that is by working in The ministry than we are missing and denying the incredible breadth of talent, of callings and of opportunities to transform the world.